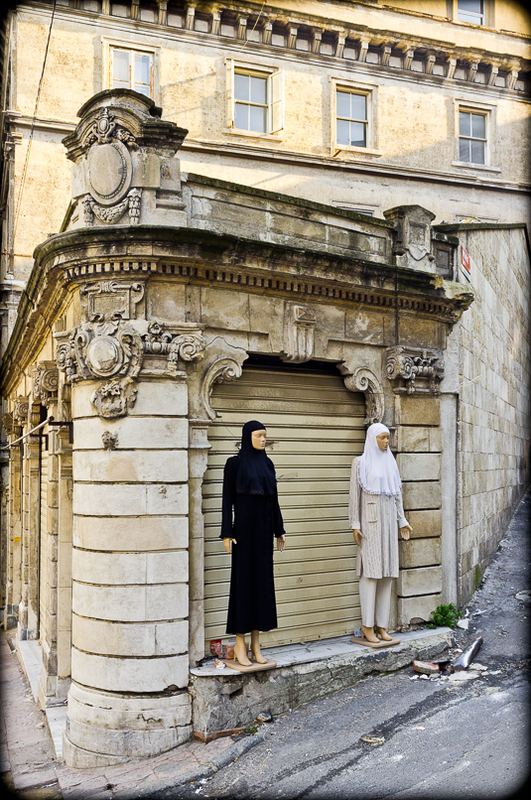 Mannequins in Black and White, Istanbul, 2013. Fuji X100. The image above is from a series of photos treating mannequins in Istanbul, their manufacture and display, part of an in-depth look into the urban geography of a traditional sector. Mannequins, as I discovered, are designed and produced according to a complex web of typology and hierarchy — price-wise and according to the class, incomes, tastes, beliefs, cultures, and aspirations of the “markets” targeted to purchase the garments in which the mannequins will be clad. In a future entry, I hope to post more photos from the series and comment further. For now, in light of the murderous bomb attack this past Saturday on Istanbul’s main pedestrian thoroughfare, Istiklal Caddesi, I am posting this photo as an all-too-obvious metaphor for the dualiities and contradictions that enrich but also plague Istanbul — its peace and its violence, its tolerance and its hatreds, its physical location straddling two continents, and its seeming temporal spanning of the world views of multiple centuries. The black-white duality of the mannequins’ garb also suggests the extremes of Istanbul’s and Turkey’s ruling AK Party and its leader Recip Tayyip Erdogan — a propensity towards confrontation, bluster, and intimidation that yields and masks a polarized polity at home, failed ambitions in the middle east, failed outreaches towards the west, and dual failures in dealing with complex conundrums of Syria and predominantly Kurdish eastern Anatolia. Black-white contrasts also characterize the history and transformation of Istiklal Caddesi and surroundings. In Ottoman centuries Istiklal was a street of palatial Ottoman homes and western embassies and, by the early- to mid- twentieth century, a western-style avenue of shops, cinemas and entertainment, with backstreets sheltering tenement housing and offering drink, music, and food, as well as bordellos, “straight” and transvestite. In recent years, Istiklal continues to change, becoming less and less upscale on the one hand, and less local and bohemian on the other, and more and more like an open air shopping mall, with rising rents forcing out independent merchants and restaurateurs in favor of chain operations with deep pockets and with historic buildings gutted, their restored facades masking modern shopping emporiums. In the backstreets, “vice” and seediness fade and “cute” coffee shops take their place. The flow of pedestrians, locals and tourists, up and down Istiklal increases each year, with the noticeable changes that the crowds seem progressively younger and the tourists as often as not (mid-)eastern as western. Even in the midst of such changes, Istiklal remains the site of political demonstrations and of symbolic acts, both democratic in aspiration, ala the summer of 2013 (scroll through the following group of posts) and, tragically, murderously anarchic as per Saturday. The black-white metaphor also points to another of the city’s contradictions. Istanbul is marketed as “multicultural” and “tolerant,” but the reality plays out otherwise. Few Istanbul Greeks remain in the city, its Armenian population stagnates, and its Jewish population ages and declines year by year as younger Jews leave for abroad. What remain of all three of the city’s traditional minority populations have moved to the comfort, anonymity, and security of neighborhoods far afield from the surroundings of Istiklal. By chance, three of the victims of Saturday’s bombing were Israelis and the attack took place within fifteen minute’s walk of the lower reaches of Istiklal, the neighborhood of Galata which, a century ago, had been home to a large Jewish population and that still houses three of Istanbul’s regularly-functioning synagogues. The three synagogues operate under extreme security, precisely due to eventualities such as Saturday’s attack — indeed, one of the synagogues was bombed fifteen years ago and attacked by machine gun and hand grenade wielding murderers fifteen years before that. Ironically, at the time of Saturday’s attack, the visiting Israelis would have been far safer attending one of the nearby synagogues than enjoying the sybaritic luxury of a peaceful Saturday morning stroll on Istiklal. This too is amongst the contradictions and ironies of Istanbul.